Hola amigos! I recently returned from racing at the Pan American Championships in Mar del Plata, Argentina. 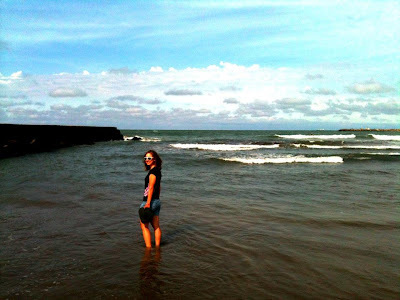 Mar del Plata is 400 km south of Buenos Aires, or about a 6-hour bus ride. It took about 28 hours of door-to-door travel time. First a flight from San Jose to Dallas, Dallas to Buenos Aires, then the fun long bus trip. Needless to say, we all slept quite well the first night. Photo for the event poster was actually from an event at the Calgary track, our soigneur Craig is in the photo! 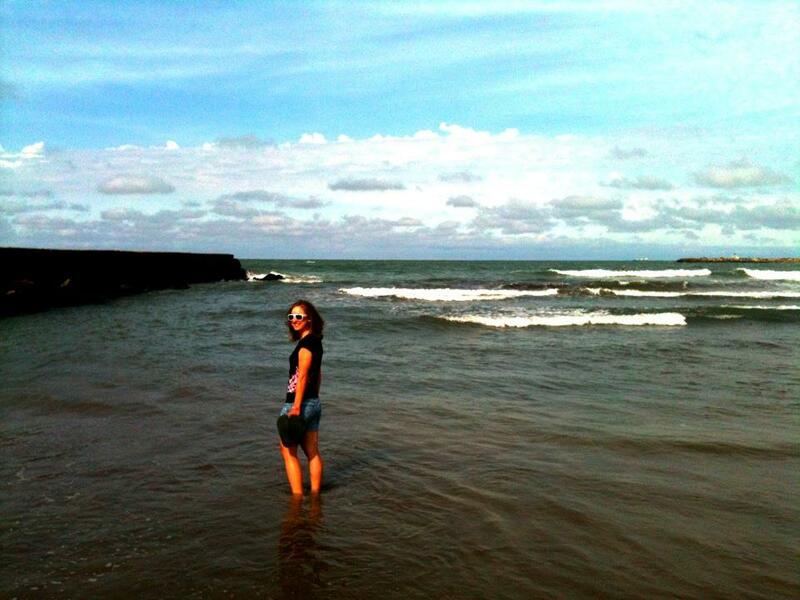 Mar del Plata is a cool beach town that sits on the edge of the Atlantic Ocean. With summer coming to an end in the Southern hemisphere, it was possible to see lots of surfers, volleyball players, children and sunbathers out playing and soaking up the sun. We had a great view of the city and ocean from the 20th floor of the race hotel. I was surprised to observe the strong European influence on everything from architecture, cars and food in the country. The whole team arrived a few days early, so we had the opportunity to do some good training rides and see the city a little bit before racing. You had to be very vigilant when riding through the city. A lot of intersections do not have stop signs or lights, the first person there appeared to have the right of way. Scary at first, but we were navigational experts by the end of the week. The primary spoken language in Argentina is Spanish. I knew about one word (hola) before this trip. It is slightly frustrating going somewhere and not being able to easily communicate. Luckily Canada brought a translator to help with race logistics. I did take the opportunity to learn a few words and phrases. Most of the Spanish I now know are phrases used at the breakfast table. Tienes aguas calientes por me avena, por favor? (Can I get hot water for my oatmeal please?) and Agua sin gas (non-carbonated water), Agua con gas (carbonated water), café con laitie (coffee with milk), and gracias (thank you). That’s about the extent of my Spanish for now, I will work on expanding my vocabulary for future trips. Lots of dulce de leche filled baked goods to be found! The meals provided by the race hotel were great. We got to eat lots of veggies and tried some of Argentina’s famous steak. The timing of meals did take a little getting used to for the North Americans; 8:30 pm for dinner is quite late! Most restaurants in Argentina don’t even open until 9 pm, and nightclubs don’t open until 2 or 3 am! This might explain why there weren’t too many spectators out for our 8:30 am start time, people were just going to bed! The first Pan Am Championship event was the time trial, raced by my OptumKBS teammate Denise Ramsden, and Exergy rider Rhae Shaw. There was some crazy wind coming off the ocean for the flat out and back TT. Denise came back to the hotel with her knee all bruised from keeping her bike upright in the wind! Rhae had a great ride and finished the day with a silver medal for Canada. The whole team was motivated going into the final event, the road race. 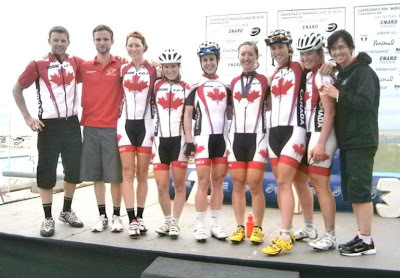 We had a strong roster for the race; in addition to Denise and Rhae, Joanie Caron (Colavita/ESPNw), Karol Ann Canuel (Futuroscope), and Heather Logan-Sprenger (Exergy) were all racing for Team Canada. The course this year was 12 laps of a 7 km circuit, featuring two short but steep climbs. There was a sweeping descent 1 km from the finish, which led to a narrow, winding road along the ocean. As a team, we agreed our best chances for a victory was from a breakaway, so this is what we went for. We threw down attack, after attack, after attack. The Americans wanted the group together for Shelly Evans, their sprinter, so they pulled back a lot of our efforts. If the race did come down to a bunch finish, then I would be the designated sprinter. The pack got smaller as the race wore on, but no breaks could stay away. An effort by a Brazilian rider on the second to last lap put some pressure on the group. She stayed away at about 15 seconds, but got caught halfway through the last lap. It was going to be bunch sprint. There was a lot of jostling for position descending into the final kilometer. I watched Shelly and the Cuban sprinters. The sprint started early, and it was an all out drag race to the finish. It was such an incredibly close photo finish between the Cuban and myself! I was very happy with my first Pan Am silver medal, and the whole team left with a lot of motivation going into the rest of the season! We finished off the trip by dipping our feet in the Atlantic Ocean, and going out in Mar del Plata for an authentic Argentinean meal before parting ways. I’m now back in North America for some races with my OptumKBS teammates and can’t wait to see what the rest of the season has to offer!